Mr. Forest Pittman, Jr., was the son of Forest Pittman, Sr., and Florence Wells Pittman, the youngest of their seven children. He was born July 22, 1929, in rural Edgecombe County, and resided in the area all of his life. Mr. Pittman attended Willow Grove and Bricks Schools. He was unable to complete his high school education because he had to work on the farm. It did not stop him from achieving his goals in life. After farming for many years, he gained employment at Merita Bakery in Rocky Mount, NC. Mr. Pittman was an advocate for developing rural communities, and he worked diligently for the betterment of the Dunbar Community. He worked with different foundations to secure funds for a matching grant to restore a historic building, which is now the Dunbar Community Center. The Center was his passion and his second home. He served as President of the Dunbar Community Development Organization and founded a feeding center; he drove the van to transport senior citizens from Dunbar, Battleboro, Red Hill, and Leggett to the feeding center on a daily basis. He also served on the Board of Directors of Nash-Edgecombe Economic Development (NEED). Mr. Pittman was a member of the Edgecombe County Planning Board, Chairman of the Board of the Baker Funeral Home Burial League Association, and a former member of Baker Funeral Home Staff. He was a loyal member of Mount Lebanon Lodge #25, and a Trustee and faithful member of St. Matthews Baptist Church. 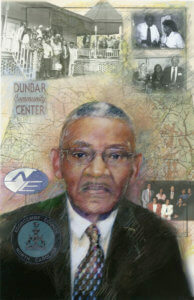 Mr. Pittman was a servant, and he received many awards for his service to the community, including the Dr. Martin Luther King, Jr., Citizenship Award, the Hazel S. Parker Award for Outstanding Contributions to Edgecombe County, the Rocky Mount Citizen Award for Outstanding Achievement in Human Relations, and the Oustanding Leadership Award to Dunbar Community. He was also a finalist for the Carolina Panthers Community Quarterback Award. He was married to the late Quenotha Hart Pittman, and they were the proud parents of eight children, 13 grandchildren, 17 great-grandchildren and three great-great-grandchildren. Mr. Pittman passed away in 2014.